This race is a bit of a wildcard amongst WRR’s normal race calendar. Crich is a large village in Derbyshire, approx. 1 hr 15 from Telford. Its only claim to fame is the Crich Tramway Museum. It also happens to be where my sister and brother-in-law live. For the past 8 years, a race has been held on the day of the village summer fete. 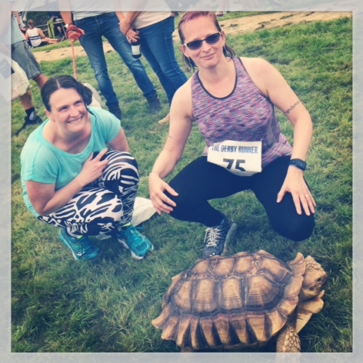 In my pre-running years I helped out with the registrations and timing but this year I didn’t really have an excuse not to join in, so I recruited Debbi Morris to keep me company and we signed up for the sell-out 11.3k, mainly off-road, event. Setting off from the village centre, we headed out of town, up our first hill where we managed not to stop, and then turned off-road. We passed through a field before an enforced rest to queue for the first of several stile/gate crossings. It was at that point that I really realised that in a race like this it’s not about a PB but just about enjoying yourself and the views (though preferably not coming last). Once over the stile, we ran through a few more fields and country lanes, and then a steep descent through woods. At times we slowed almost to a walk in favour of staying upright, and were concerned that we were holding up those behind us, but a quick glance behind seemed to suggest we were not alone in feeling the need to be cautious. After what felt like miles (but approx. only 2 miles into the race) we came out of the woods and onto a canal towpath. This felt good and we picked up the pace a little. Another two miles and the time came for the inevitable tough climb back upwards. We knew we had approx. 900ft of ascent to tackle. Trying to keep running as much as possible, at one point we looked up and saw a long line of participants trudging up what appeared to be a near vertical field (OK, perhaps a slight exaggeration), none of them running. Apparently even the race leaders walk up that bit. The field-mountain conquered, we had a glimpse of the highest point in the race, Crich Monument, a war memorial, and set off on jelly-legs around the edge of a quarry to reach it. Once past this point we knew the final mile was downhill back into the village and onto the playing fields where my sister & niece were waiting to cheer us over the line. At 1:24:29 we managed an average of approx. 12 min/mile which we were quite pleased with given the terrain. Rewarded with beer (no medal), we then enjoyed a barbeque and more liquid refreshments before returning to Telford. Good day out for anyone willing to venture that far.